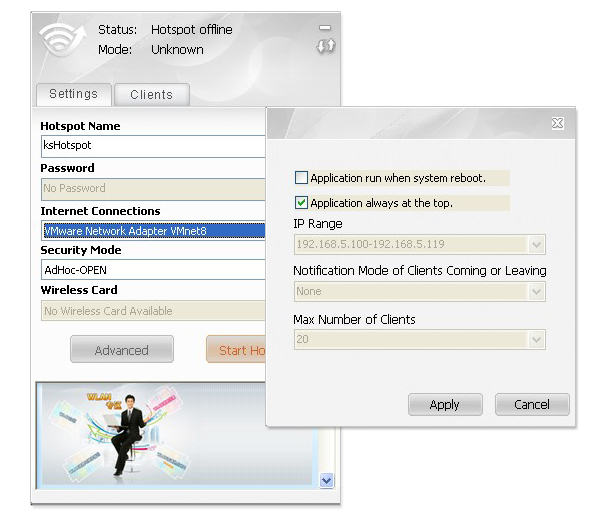 Virtual Hotspot is a free application to turn your laptop/PC into a Wi-Fi hotspot. Then you could share your internet access with other wi-fi enable devices. It works on both MS Windows XP and Windows 7. Last update 9 Aug. 2012	Licence Free	OS Support Windows 2000, Windows XP, Windows Vista, Windows 7	Downloads Total: 84,275 | Last week: 2 Ranking #112 in Others Publisher Godsw,inc. Give Wi-Fi access to your other devices and to friends and family with this cool Windows utility. Web access for any kind of computing device isn't really an option now-a-days. Its pretty much a giving and a necessity. If your computing device doesn't have internet access, its dead in the water. Stale stagnant, and near useless were how they were described to me by members of my family. That's why I like apps like Virtual Hotspot Free. It’s a network utility for Windows. Virtual Hotspot Free turns your laptop/pc into Wi-Fi hotspot. With it, you can share your Wi-Fi, LAN, Cable Modem, Dial-up, Cellular, etc. internet access with other Wi-Fi devices, such as laptops, smartphones, tablets, PDAs, game consoles, etc. As long as you have an active connection to your laptop, you don't need a wireless router or access point in order to share your internet access. The best thing about Virtual Hotspot Free is that once your PC has access to the internet, every wireless device in your house can have access to the internet. The one thing you need to be aware of, however, is that the app must be running and your PC must have access to the internet before it can be shared. If your turn your PC off, access on your other devices also goes dark. Conclusion: However, the app works on all versions of XP and Windows 7, allows you to share access with an unlimited number of wireless devices and supports password level security. The app is best used on a desktop or other stationary, non-mobile (read – not a laptop) device that you don't plan on turning off. At least with it, you don't have to have a wireless access point or other wireless broadcast device, in order to provide internet access to your other wireless devices.